In our family Christmas starts early, sometimes as early as January, but always before woolen sweaters are pulled from drawers. We buy gifts to tuck away in closets, sew stockings, embroider names and create clever little plots to send some poor unsuspecting guest on a treasure hunt for his or her present. On more than one occasion I’ve been the unsuspecting guest and oh what fun it was. 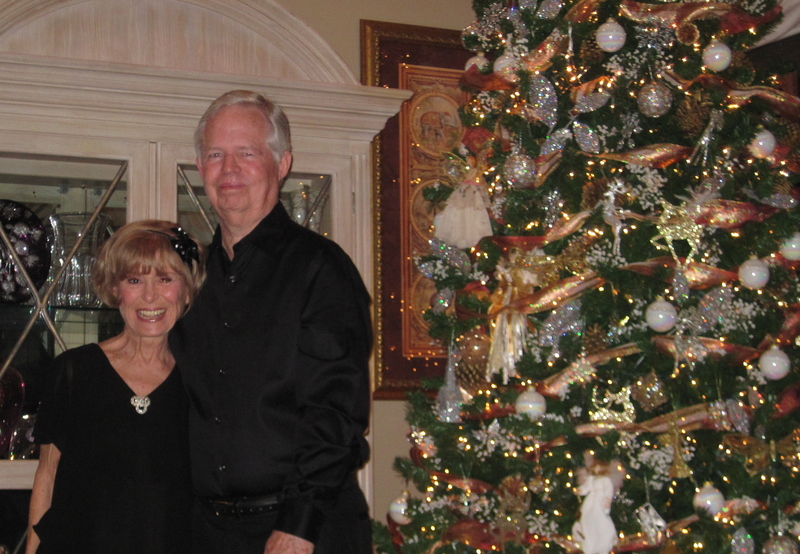 The most memorable occasion was the Christmas before hubby and I were married. He had given me gifts of jewelry during our courtship and they were always wrapped in the same paper with a shiny gold tassel tied on top. Since we’d already set the wedding date, I expected him to give me an engagement ring for Christmas and sure enough, under the tree was small package with the Jeweler’s gold tassel glimmering in the twinkle of Christmas lights. Our tree was a twelve-foot high spruce that we had chopped down and carted home from the tree farm; underneath the tree were dozens upon dozens of beautifully-wrapped presents. My eye went directly to the gold tassel; “Oh, you’ll have to open that one last,” my soon-to-be hubby said. So I waited as the rest of the family unwrapped shirts, sox, bathrobes, picture frames and knick-knacks galore. Finally it was my turn. The box felt heavier than I’d expected, but slowly I peeled back the gold paper, then my jaw fell… “a watch?” I sighed, removing it from the box. My disappointment was quite obvious, but future hubby was smiling. He expected it to take a good hour or so for me to locate the little red lacquer ball hidden in the branches of the gigantic tree…but as I said earlier, I come from a family who specializes in Christmas and I knew every ornament on the tree. Each and every bauble meant something to me—many were hand-made, clothespin dolls and felt angels with pipe cleaner halos, snowmen, Santa’s and bells tied atop the packages of Christmases gone by, ornaments that were gifts from friends, some from people long departed… everything on the tree was rooted in family tradition. 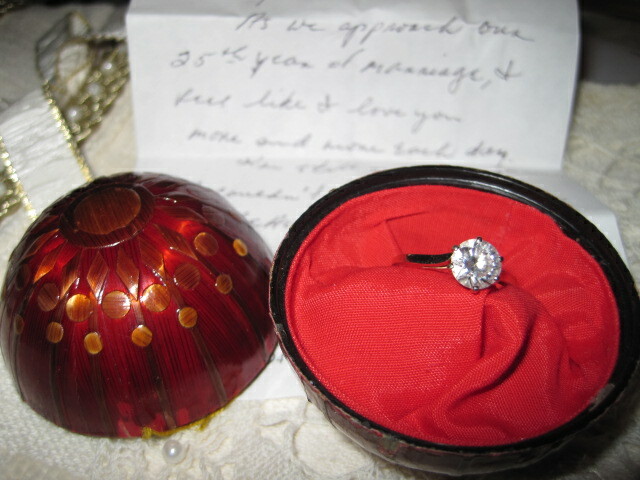 It took five minutes to find the red lacquer ornament and less than a heartbeat to open the ball and find a beautiful diamond ring that was precisely my size. That was twenty-five years ago. This year hubby and I will celebrate our silver wedding anniversary. As for the red lacquer ball that held my ring…it still hangs on our tree every year only now it comes with a new tradition, one that warms my heart more than words can say. Each year before I hang the ornament on the tree I open it up and inside is a new love note from the man I am so happily married to. Ah, now I understand where that part came from. How lovely…..